The constant “whoosh” of the cooling fans and equipment has the potential to cause stress and fatigue while also restricting the ability of workers to communicate. 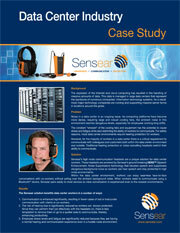 For safety reasons, most data center environments require hearing protection for workers. However, for the majority of workers in a data center there is a critical requirement to communicate with colleagues and customers both within the data center environment and outside. Fill out the form on the right to download the case study and learn more.